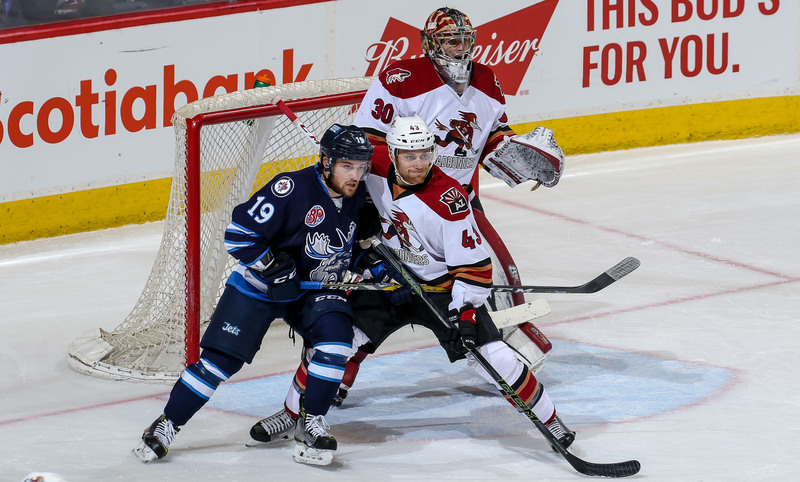 In another back-and-forth battle Sunday afternoon, the Roadrunners fell just short in their 4-3 loss to the Manitoba Moose at the MTS Centre. 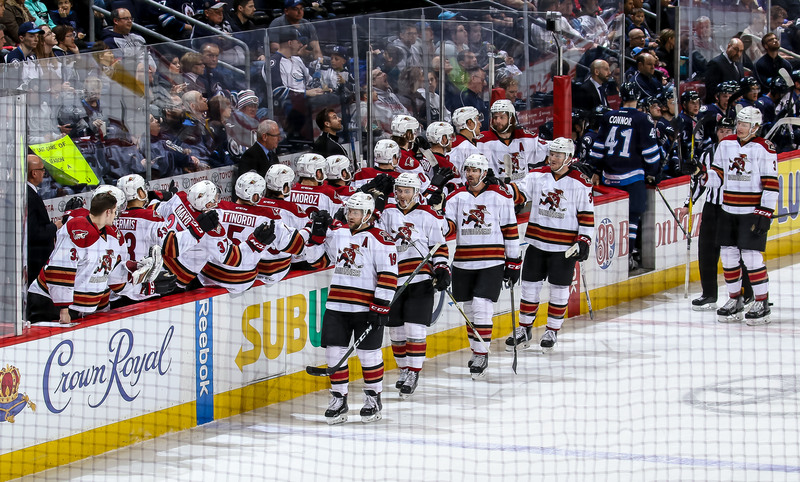 It was the team’s first regulation loss to Manitoba this season; the Roadrunners finished their regular season series against the Moose with a 2-1-1-0 mark. Manitoba, again, jumped out to an early two-goal lead with a pair of markers in the first 12:47 minutes of play. Chris Mueller, coming off of a four-point performance Friday night against the Moose, stayed hot in Sunday’s rematch, netting the Roadrunners’ first goal of the day when he slammed home a ricochet puck past Manitoba’s Eric Comrie on a power play with just over two minutes left in the opening frame. Just past the midway mark of the second, Mitch Moroz tied the game 2-2 when he banked home a shot that bounced off the end boards, sneaking a tight-angle shot past Comrie to register his fourth goal of the season. Mark Cooper recorded his first-career American Hockey League point on Moroz’s goal with the secondary assist. The Moose reclaimed the lead late in the second period after Marek Langhamer mishandled a puck behind the Roadrunners net. With under 12 minutes to play in regulation, Michael Bunting fled to the net as Christian Fischer set up a zone entry, tipping home a Fischer wrist-shot to tie the score 3-3. The Moose took a 4-3 lead with 9:51 left in the third. The Roadrunners pushed late with an extra attacker, but were unable to replicate the late-game magic that granted them overtime in the teams’ previous meeting on Friday. Chris Mueller, with two more points (1G, 1A) Sunday, finished the season with 10 points (3G, 7G) in four games against the Moose. He now has 64 points (18G, 46A) on the season. Marek Langhamer made 33 saves in the loss. The Roadrunners will continue their season-ending five-game road trip with a pair of games this week against the San Jose Barracuda at the SAP Center, before capping their inaugural campaign against the Stockton Heat this coming Saturday.